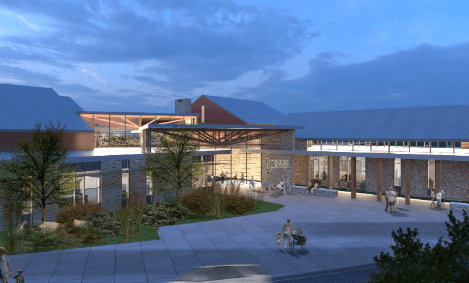 In 2016 Commerce City, CO started building their new 44 million dollar 108,000 sqft Bison Ridge Rec Center. 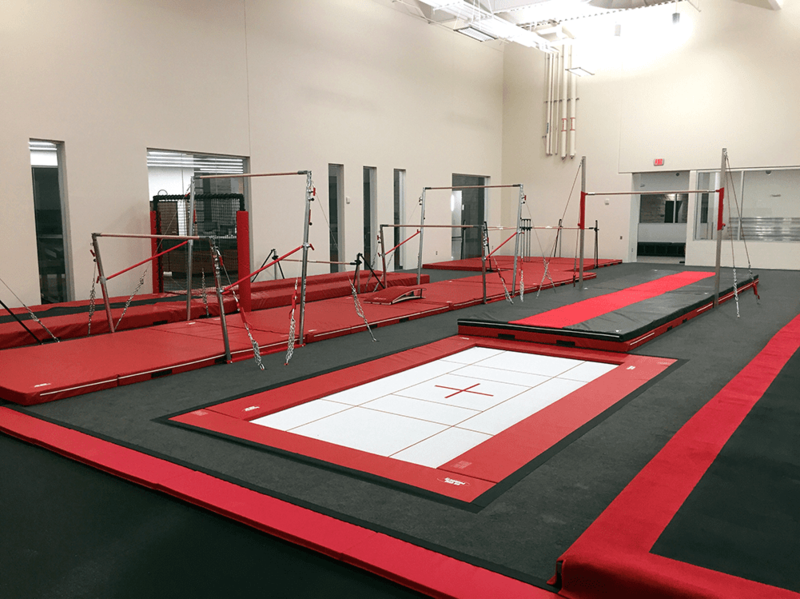 In 2017, a national search began to find a company that could deliver exceptional quality equipment and installation services for the gymnastics part of this new state of the art facility. In the end, there was only one company that could deliver, US Gym Products. 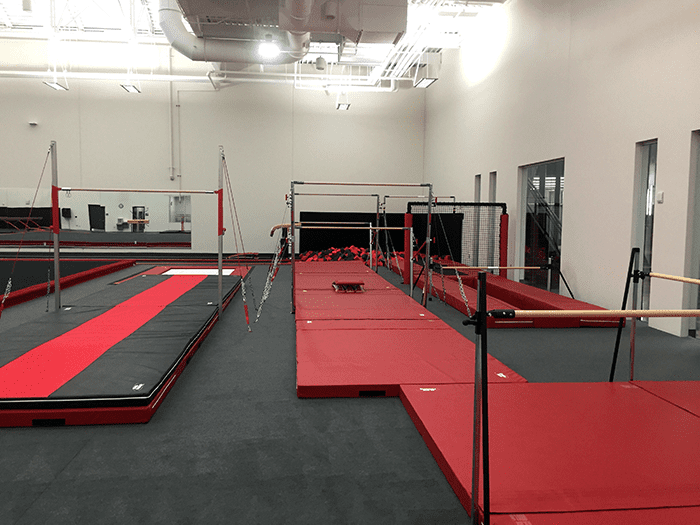 We were contracted in January of 2018 and immediately did an onsite review and evaluation so we could get started on designing and ordering the custom matting and equipment for this new 10,000 sqft gymnastics room. 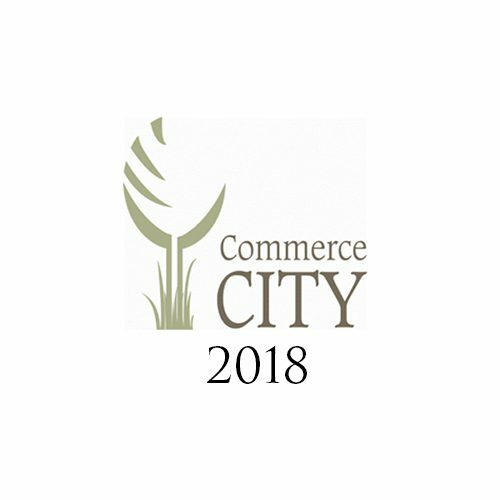 During our onsite review, we found several design flaws in the facility that needed to be corrected. 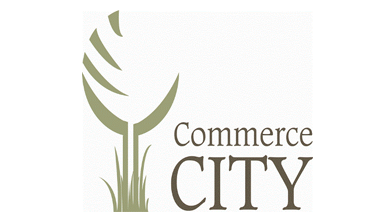 We were able to come up with innovative solutions that not only resolved the problems. but added a dedicated vaulting runway which was not part of the original plan. 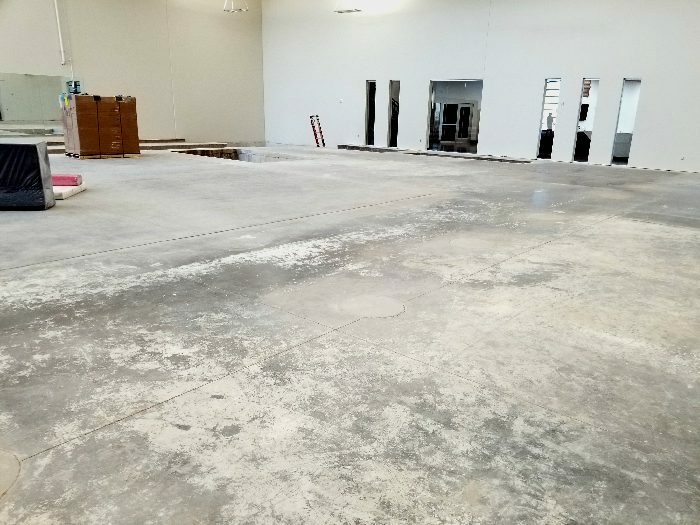 Additionally, the entire facility is wall to wall carpet bonded foam for extra safety. 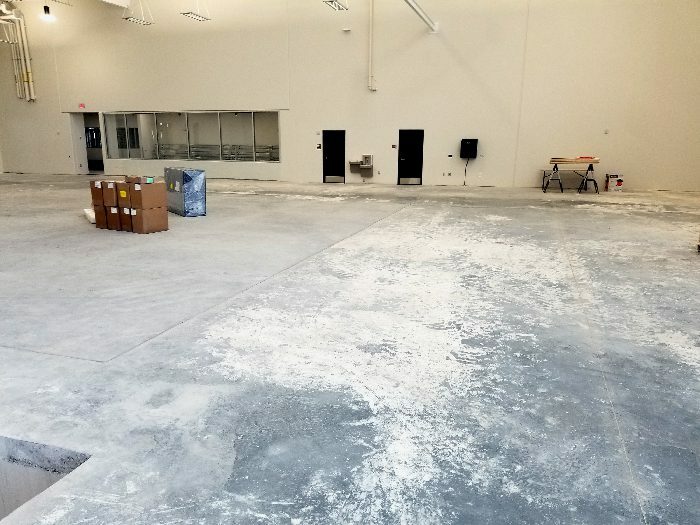 Below you can see the dramatic before and after of the entire facility. This is the recess in the concrete for both the tumbling strip and the Tumbl Trak. In the original design, there was an 8′ wide recessed tumbling strip then a 3′ space, then the recessed 62′ inground Tumbl Trak. There was no permament location for a vault table. 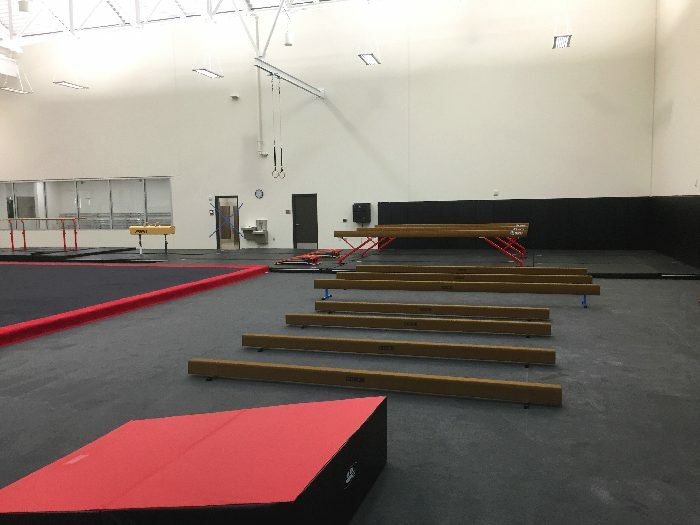 They planned on moving the vault table on and off the tumbling strip and using it both for tumbling and vaulting. This is less than ideal for many reasons the least of which being the instability of a vault table on a spring floor. 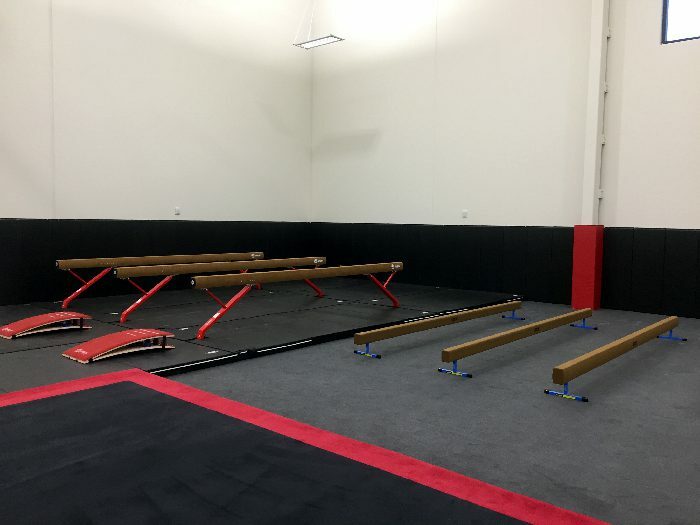 Also having a 450lbs vault table on the tumbling strip would damage the carpet bonded foam. Clearly this was not a good idea. 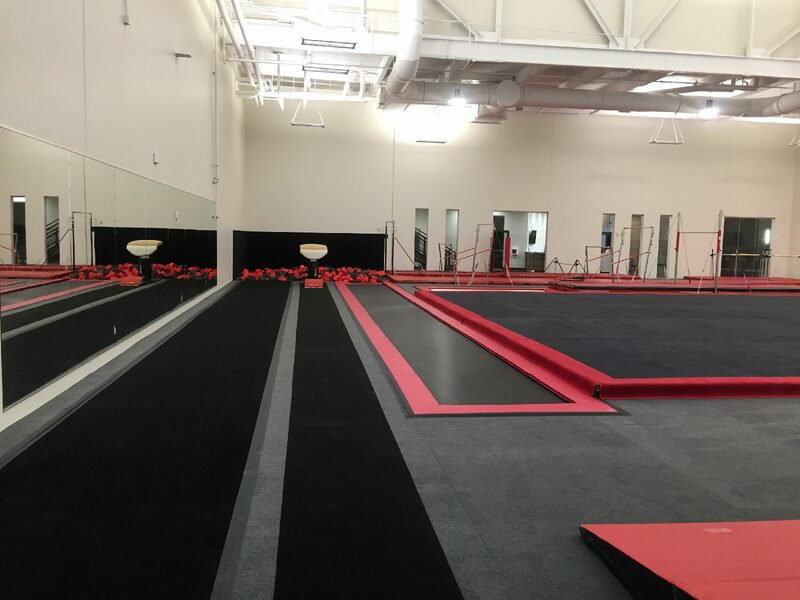 We redesigned this area by narrowing the tumbling strip from 8′ to 6′ wide. We then built a sub floor filling in 2′ of the recessed tumble strip area giving us a total of 5′ between the tumbling strip and Tumbl Trak. 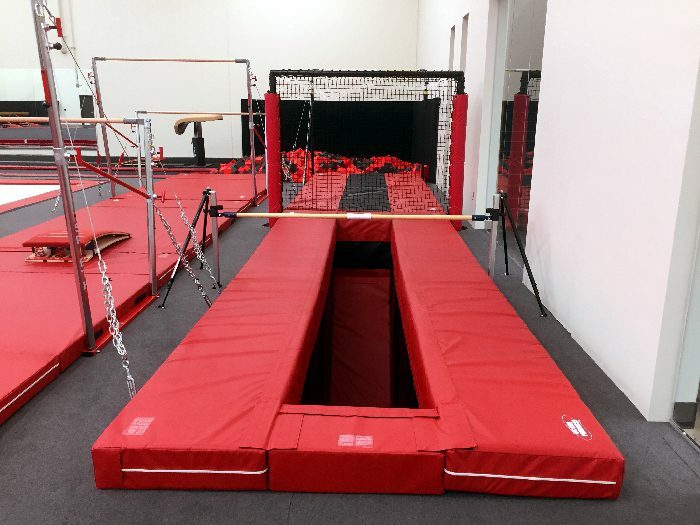 This was wide enough to install a permanent vaulting table that goes into the deep foam pit. In this picture, you can see the outline of large concrete square in the middle that looks different than the concrete around it. The original plan called for a recessed 40x40 spring floor. This is inherently unsafe because if an athlete lands just out of bounds, they will be landing on hard concrete, padded or not. Expanding the recess too accommodate a larger floor was cost prohibitive. So we decided to simply fill in the recess and have a raised spring floor. This also allowed us to expand the spring floor to a 42x42 which give us a 12″ safety border around the competition area. Here you can see our custom made carpet with a black 40x40 competition area and a 12″ red border around it. This compliments the charcoal carpet bonded foam that pads the entire facility. The balance beam area before installation. You can also see. (4) vertical steel beams in the right picture that needed to be padded. The finished beam area showcases the (7) low beams as well as the (3) competition beams. This entire area is covered in wall to wall carpet bonded foam for safety. 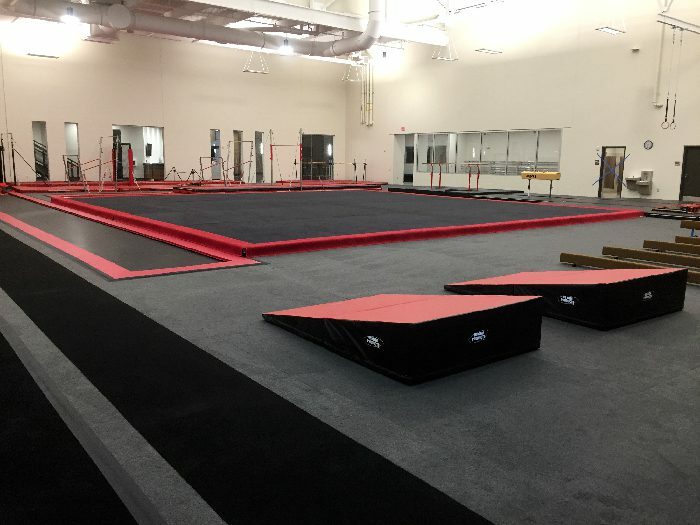 All the Competition beam mats are connected to each other creating a seamless training surface. On the walls you can also see the 2″ thick black wall pads that were installed. Also the (4) steel columns have red post pads on them both keeping up with the gym color scheme and making them stand out for added safety. 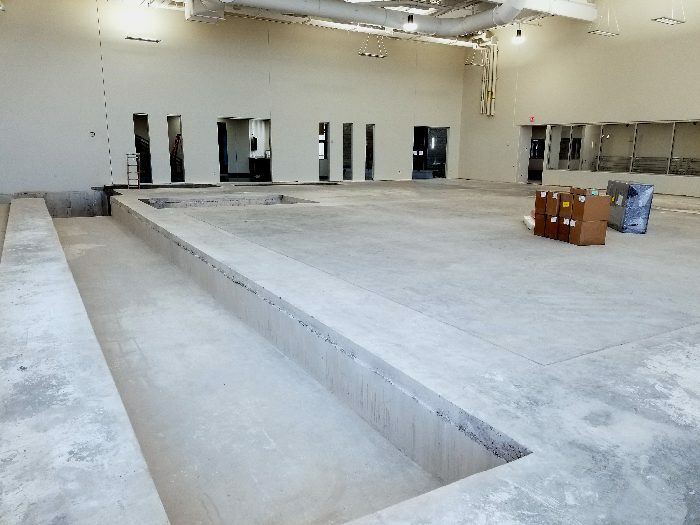 The single rail was to be placed at the end of the bar pit up against the main 20’x18′ deep foam pit(in picture, 20′ left to right and 18′ front to back). There were (2) major issues with the concrete design/construction. The pit bar pit was only 7’x14′ which is too narrow and to short to dismount safely. And, the main 20’x18′ pit was poured as (2) separate pits 9.5’x18′. There was a 12″ thick concrete wall running (left to right in picture) in the pit. 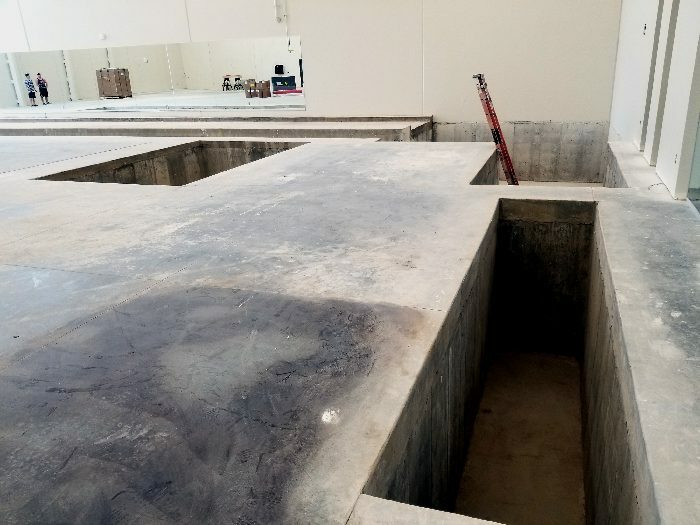 This meant there was only about 10′ of dismount space from the pit bar into the deep foam pit before you hit a concrete wall. This wall as you can see from the pictures was removed. This solved the pit bar into the deep foam pit problem. The 7’x14′ long trench was filled in with a 7′ x 14′ x 24″ resi mat. 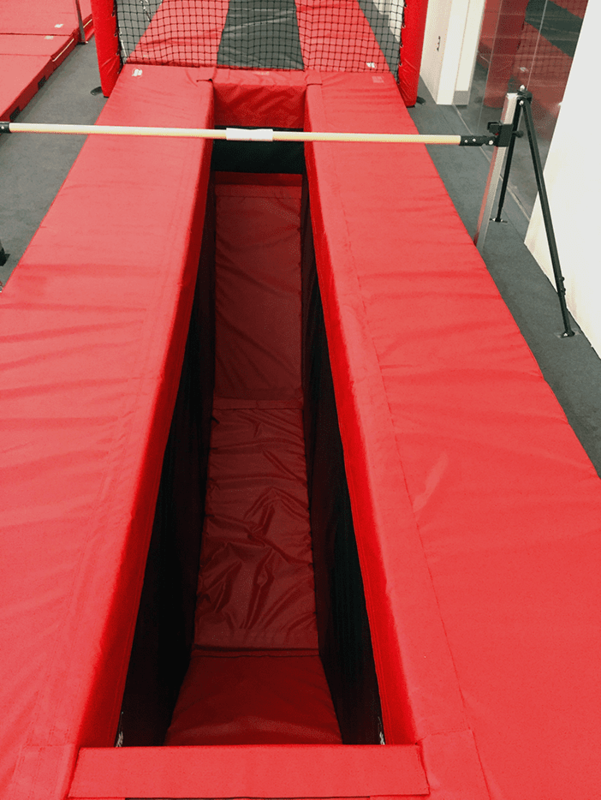 Then a 8’x16′ long 8″ thick mat placed top that extended beyond the bar pit up to the trench bar pit. 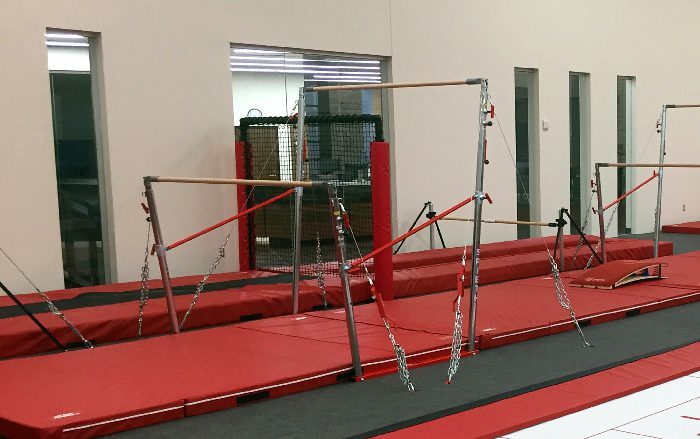 You can see this in the above picture looking on the other side of the uneven bars. 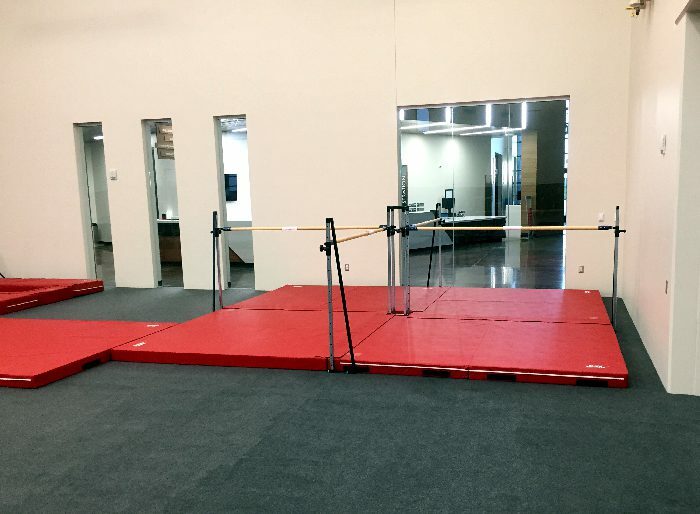 This gave us an 8’x16′ padded landing area for athletes to dismount on. Additionally, since the trench bar was so close to the pit bar. We installed a padded netting system so kids couldn’t fall accidentally into the trench bar pit. The before and after pictures of this area shown how clean this area is. You can also see the 7x14 inground trampoline with its pads flushed and velcroed to the carpet bonded foam floor padding. 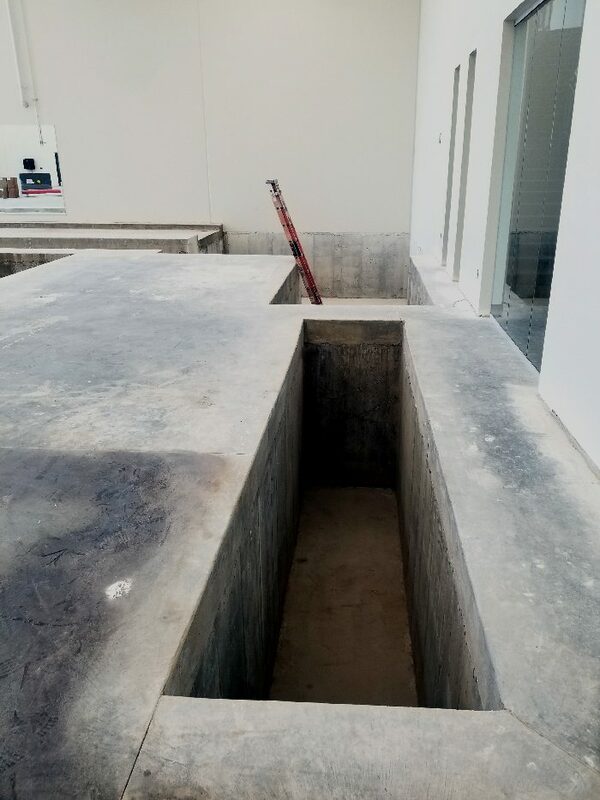 The trench bar features 8″ thick red pads around the top of the pit, 4″ thick black wall pads for extra safety and finally 12″ thick bottom red pads. These bottom pads are inclines at the two ends. All the pads are connected together with velcro connector flaps to make it a seamless and safe training area. The entire bar area is clean and safe. The deep foam pit has carpet bonded foam padding on all the interior walls. 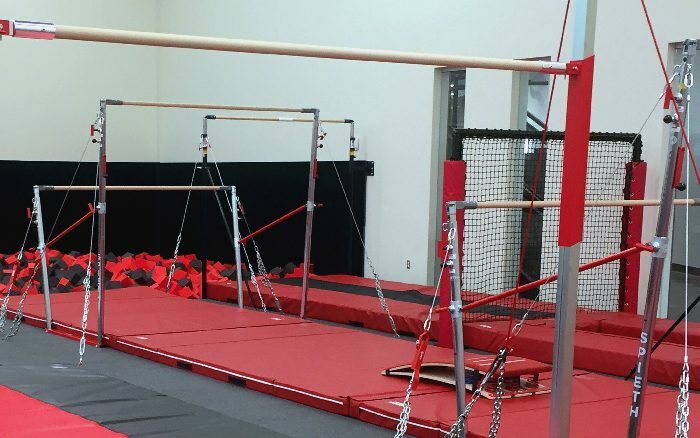 The quad bar area gives an additional training area for younger athletes as they work on their basic skills. This new multi million dollar facility will service the community for many decades to come. 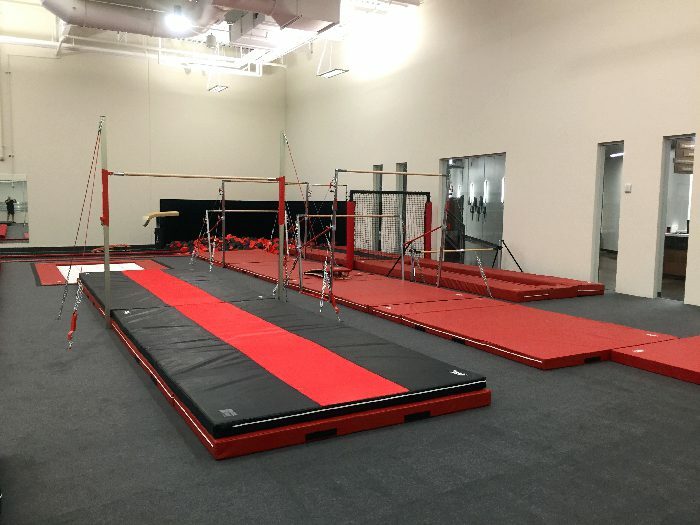 US Gym Products was proud to help bring this facility to life for the community it now serves. 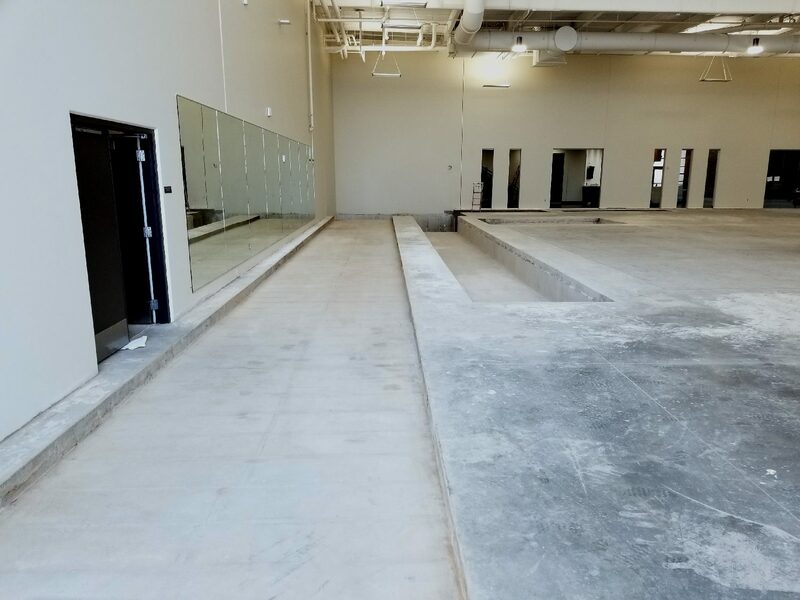 US Gym Products was contracted to perform an onsite review and evaluation of the Bison Ridge Rec Center in Colorado. 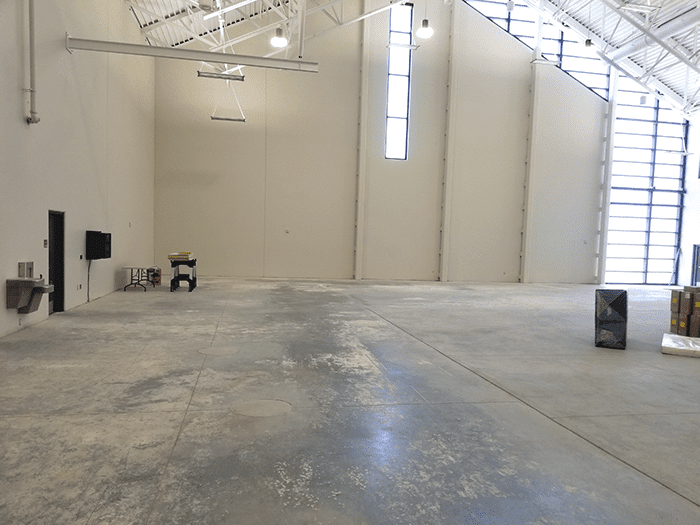 We were hired to design and order the custom matting and equipment for this new 10,000 sq. 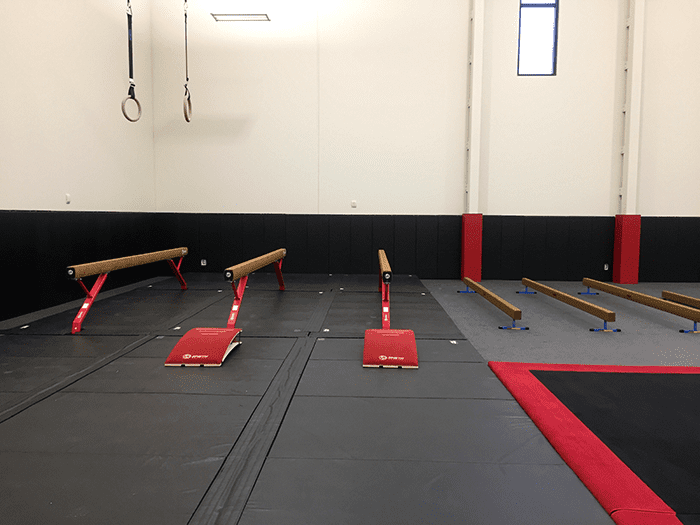 ft gymnastics room.